A little extra space and room for any type of traveler! There are only a select few options to choose from when searching for 3 bedroom cabin rentals in the Branson area, meaning that the ones that are available are typically in high demand. Able to accommodate many different types of travelers from medium-sized families to groups of friends – you will find that these units balance cost and space to provide remarkable value for your money. Typically sleeping 8-10 people, three bedroom units are usually equipped with a master bedroom, a couple of guest rooms, and (usually) a sleeper sofa in the living room area. Falling in the middle in terms of square footage and the number of guests they can sleep, these cabins are the perfect blend of affordability and room for many different types of travelers. Families will appreciate the ample space found with each, while friends traveling together can take advantage of some of the privacy that you will find in the rooms. Not the largest or smallest sizes of cabins found in Branson, these properties offer up an affordable way to stay on your next trip or vacation while still delivering all of the features and amenities you might want during your time in the Ozarks. Limited Availability, Book As Early As Possible! 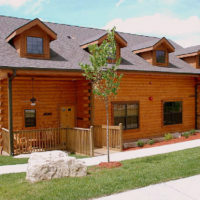 There is a very limited selection of three bedroom cabins in the Branson area. Typically, these size units can accommodate up to 8 people (usually 2 people per bedroom and 2 on the pull-out sleeper sofa) – making them ideal for larger families or groups traveling together. Because of the short supply of these cabins, you will find that these units book up quickly – so we highly recommend reserving as soon as possible in order to ensure there will be availability. There are very few 3 bedroom cabins in Branson! We strongly recommend reserving your stay as early as possible to ensure availability and the best rates!